In the last 24 hours, where the temperature did not go over 2°F, we racked up another $15 in electricity usage. And our thermostat was set to 60°F for much of that time. This cold snap is crazy. Out of curiosity, I wanted to figure how much it costs to heat our house on days like these, where the temperature hovers around 0°F all day long. The answer turned out to be about $7. If you’re curious too, I arrived at this number by separating the portions of our electric bills that have to do with heating and cooling from the rest. We have a heat pump with supplemental electrical resistance heat, so it’s not quite as straightforward as looking at a gas bill. The first step in doing that is to figure out how much of the bill to attribute to heating and cooling. I started with the assumption that the heat pump uses roughly the same amount of energy to heat the house one degree in the winter as it does to cool the house one degree in the summer. This isn’t really true, but we have to start somewhere. Next, we need a way to correlate each bill with how hard the heat pump had to work that month. The National Weather Service keeps climatology records that make this pretty simple. Among the monthly statistics that they maintain are the number of heating and cooling degree days. (For each day, add or subtract the average temperature from 65°F to get the number of degree days. 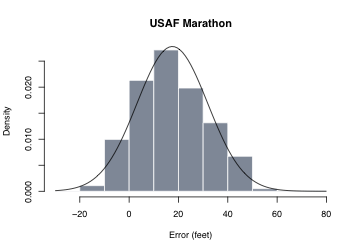 For example, if the day’s high was 20°F, and the low was 10°F, then the average temperature was 15°F. That’s 50 heating degree days, because the heat pump had to keep the house 50° warmer than the outside air.) The more degree days, the harder the heat pump has to work. The National Weather Service gives us the number of degree days each month, so we can show how hard the heat pump had to work each month. 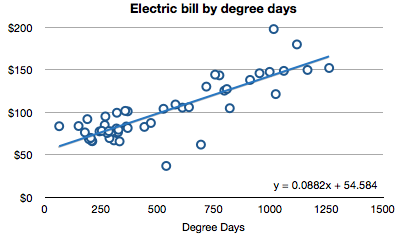 The graph below shows our electric bills plotted against the number of degree days that month. Another assumption is that aside from heating and cooling, our electricity use is constant throughout the year: above a certain baseline, all of our additional energy use is for heating and cooling. The linear approximation in the graph above shows that in a hypothetical month with zero degree days, meaning that the heat pump did not have to do any cooling or heating all month long, our electric bill would be about $55. Anything above $55 on our electric bill is a result of heat pump use. Specifically, each degree day adds 9¢ to our electric bill. Given yesterday’s official high of 29°F and this morning’s low of -4°F observed on my car’s thermometer, the past 24 hours are worth 52.5 heating degree days, or $4.73. Tomorrow we might get more official data from the NWS’s observed weather history graph. I need to revisit one of my assumptions, though. Heat pumps do not work very effectively at very cold temperatures. The heat pump can only maintain a certain maximum differential between the outdoor and indoor temperatures. Below this point, it needs to use the electric resistance backup heat, which is much less efficient than the heat pump operating alone. Since yesterday was extremely cold, and we used resistance heat rather than the heat pump, we can simply subtract the difference between the past two mornings’ electric meter readings, and find 99 kWh used in the last day. At our current average rate of 7.6¢/kWh, that’s $7.52. How much of that was due to heating, as opposed to normal electricity use? The graph above shows that a hypothetical month with zero heating or cooling degree days would have us using 313 kWh of electricity. 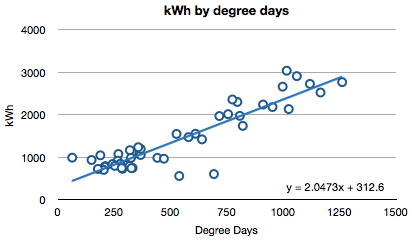 However, for the past 24 months, our baseline figure has been 164 kWh, or 5.4 kWh/day. So, if we take out 5 kWh for regular household use, we used 94 kWh to heat the house yesterday, which comes to $7.14. 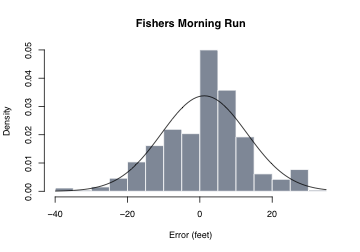 More experimenting with the Google Chart API. I found a nice Google Chart Generator GUI that is a more polished and complete implementation of what I started with my state mapper project. At any rate, the highlights are 7 5ks and 3 halfs in 2008. 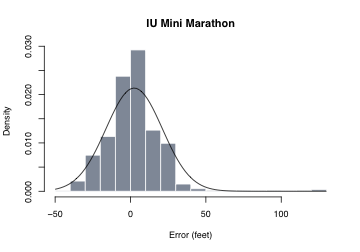 I have decided that the half is my favorite distance: long enough to be a significant effort, but not quite as consuming as a full marathon. 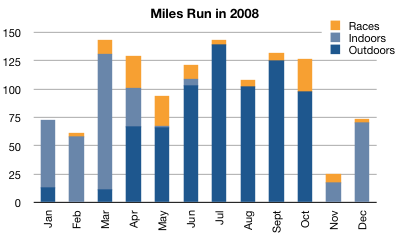 See some other Indianapolis‐area upcoming road races in my race calendar. You can subscribe to the calendar for automatic updates, as well. I visited 8 states in 2008. Not as many as in past years, but better than nothing! Creating the map was pretty simple, using a quick and dirty tool I wrote to take advantage of the Google Chart API. Running 1,226 miles in a year has a way of wearing out shoes. We ran in 20 races this year, and we had a lot of fun doing it!